It’s a spectacular achievement for a magazine to survive ten years of life on the newsstands. To emerge unscathed on the other side of a decade must be an incredibly proud moment for the publishing team – especially at a time when sales seem to be dropping across the board, with many titles losing the fight along the way. It’s no mean feat to be able to come up with an endless supply of new ideas, forecasting trends month after month, trying to capture the exact moment in the life of the average reader. And yet Woolworths Taste magazine has accomplished all of this and even more. Their 10th anniversary issue has just hit the shelves. 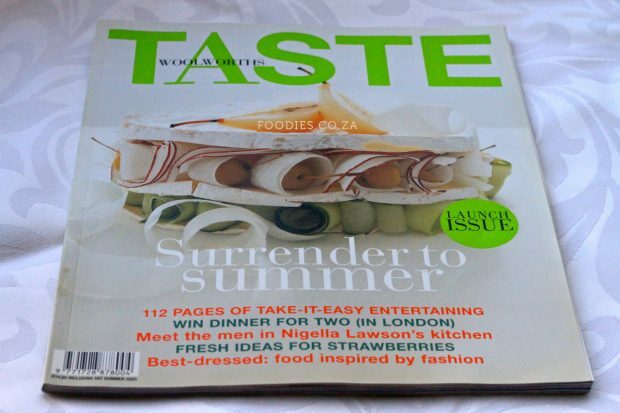 I still have the launch issue of Taste tucked away in my magazine archive, fresh from the summer of 2003 at a bargain price of R19.95. As I sit here paging through it again for the umpteenth time, I’m trying to remember where I was and what foods I was exploring and cooking and eating way back when. A browse through the pages brings up memories of the big, bold, beautiful and colourful photos that first drew me to the magazine. The freshness and vibrancy of summer jumps out from each of the pages, nudging me to the kitchen to replicate (and try and reinterpret) the majestic spreads. As I think about foodie times gone by, I remember that Blues in Camps Bay was the place to be seen. Asian was popular and spices were a feature. Frozen yoghurt had shaken the ice-cream tree. These trends have changed in some ways and matured in others. Asian is more popular than ever. We’re now playing with bolder spice mixes and flavoured salts, oils and vinegars. Food quality is now under constant scrutiny as food allergies (and other health issues) are on the rise and people scour labels and ingredients, wanting to know exactly what they’re putting into their bodies. Food markets and food trucks have now arrived and most modern consumers value sustainable, eco-friendly, organically produced foods that can be purchased directly from the source. Phillippa Cheifitz was the Food Editor of the debut issue of Taste, setting out to convert all the “have-to-cooks” into “love-to-cooks”, with easy to prepare, minimum-fuss, fresh ingredient type of cooking. Sumien Brink as the Editor-in-chief declared that she was thrilled to be able to indulge two of her greatest passions: magazines and food. And by the looks of things, she’s had a lot of fun doing it. 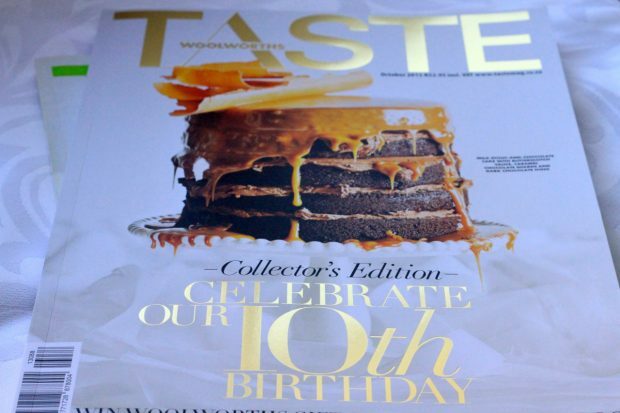 The 10th birthday Collector’s Edition of Taste magazine is their 88th issue and weighs in at a hefty 144 pages (as against the 112 pages of the launch issue a decade ago) at a price of R32.95 (less if you have a Woolworths Card), which is still a great price 10 years later. Abigail Donnelly is now the magazine’s Food Editor and Sumien Brink is Head of Content. Comparing the latest issue to the very first, it’s clear that the team has pulled out all the stops to put together an amazing collection of food inspiration. There’s something to tempt any palate and excite every type of foodie. 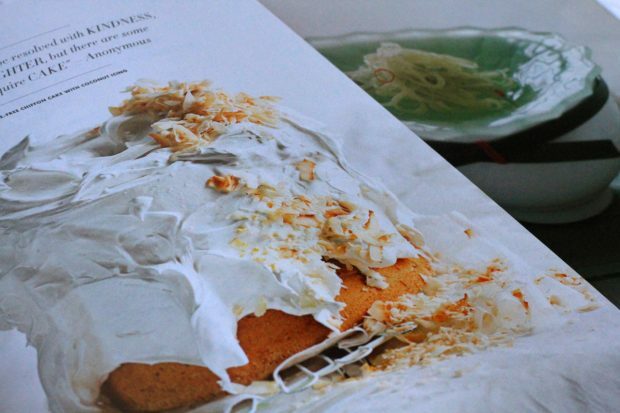 The words paint pictures about topics that range from books and markets to top chefs and stunning cakes. The recipe range is varied and encapsulates everything you need to create showstopping starters, light meals and beverages. And the photos in the birthday edition are of eye-watering beauty, drawing you in and keeping you close until you’ve devoured each and every page. It’s a gorgeous issue that does a sterling job of putting on paper some of the very best of what South African food has to offer. As I wiggle both copies back into my over-piled archive, I can’t help but look forward to seeing what the Taste magazine team cooks up in the next 10 years. It can only be good.